Miami University, located in Oxford, Ohio, is one of the oldest public institutions in the nation. With a student body of over 21,000, Miami University has a well-known academic reputation that attracts employers and recruiting firms. From the Ohio Department of Taxation to the International Center for Terrorism, Miami delivers transcripts to a broad range of receiving colleges, businesses, and organizations. After Miami launched their Transcript Ordering℠ service with the Clearinghouse, they realized significant time and cost savings for their registrar office. Miami’s biggest priority was finding a way to automate the process, since they did not have the option of dedicating more resources to the student transcript needs that were flooding their department. After implementing their new service, Miami was able to revolutionize the way that they handle transcript orders, which, for example, could average between 2,000 and 3,000 requests per month. The Clearinghouse helped Miami create an integrated transcript solution, which effectively streamlined Transcript Ordering with their Banner student information system (SIS). Due to the large quantity of orders Miami gets, this system has been the most efficient way to maintain speed and accuracy. It empowered the student to become a more active part of the process, enabling the registrar office to reduce their manual process by 90%, cutting from 100 staff hours to 10 per week. 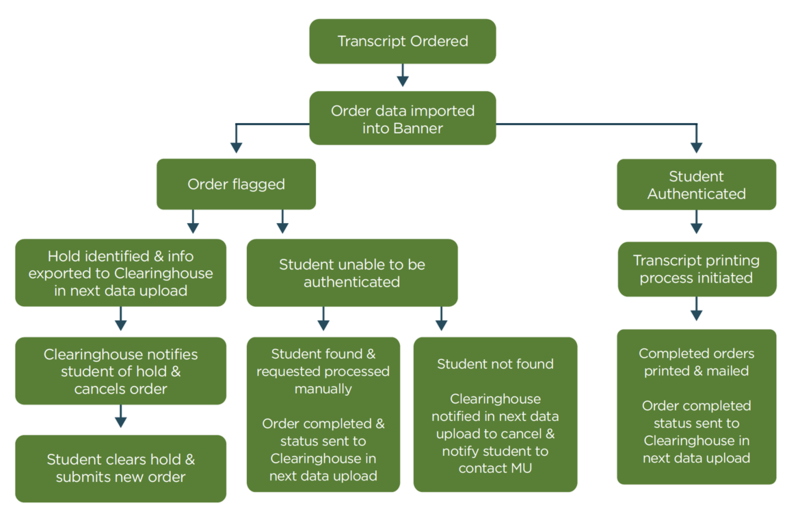 Once a day, the Clearinghouse sends a batch order to Miami, and then their Banner system automatically matches each student record with the request, identifying records with a hold status. At this point, Miami is able to complete and deliver the approved orders and automatically cancel orders on hold, so that requests never sit in the queue. As soon as the Clearinghouse notifies the student via email, it becomes his or her responsibility to resolve the hold issue. Miami values the higher level of service that their students get — and with their current process, their students never are left to wonder if their orders are lost or forgotten. On average, their office only gets 8-10 orders per day that require a staff member to investigate their records (e.g., records dated prior to 1978). Miami is now able to fulfill a high volume, maintaining expedient service to their students and partnering schools and businesses. Shortly after launching their service, Miami also activated the paperless consent option. In just a couple of months, they saw 98% of their student requestors take advantage of this option, which allows them to speed their orders through the process. Compared to their old paper ordering system, the university achieved a higher rate of accuracy in order fulfillment, because students now typed in their own recipient information. Transcript Ordering collects payment on demand of service quickly and easily, and removes the university from the money collection process altogether. The revenue they generated absorbed costs from the general university budget, enabling Miami to use income from Transcript Ordering to support their registrar office. Miami’s registrar office worked with the Clearinghouse’s IT staff to create a custom solution where Transcript Ordering would communicate with their Banner system. From the point where they began exploring a new approach to transcript service, the Miami registrar staff knew they needed a solution that could alleviate the time and resources transcripts were consuming. After undergoing budget and staff cuts, they decided the most beneficial investment would be to build an integrated solution that tied Transcript Ordering and Banner together. The Clearinghouse played a significant role in making the integrated service possible for Miami University. Their IT and Client Services staff became instrumental during the testing process and were able to help Miami anticipate all of the possible student scenarios. The result was a time-saving solution that automated the majority of the transcript ordering process, and allowed Miami to focus their resources in other important areas.